Online slots fans don’t really have any need to actually go to Egypt – there are so many Egyptian-themed games that unless you want to get on a plane you can learn all you need to know from spinning the reels. While that may not be entirely true there are many such slots and Gods Of Giza is another to add to the list; it’s from Genesis Gaming and it’s a little different from the norm. 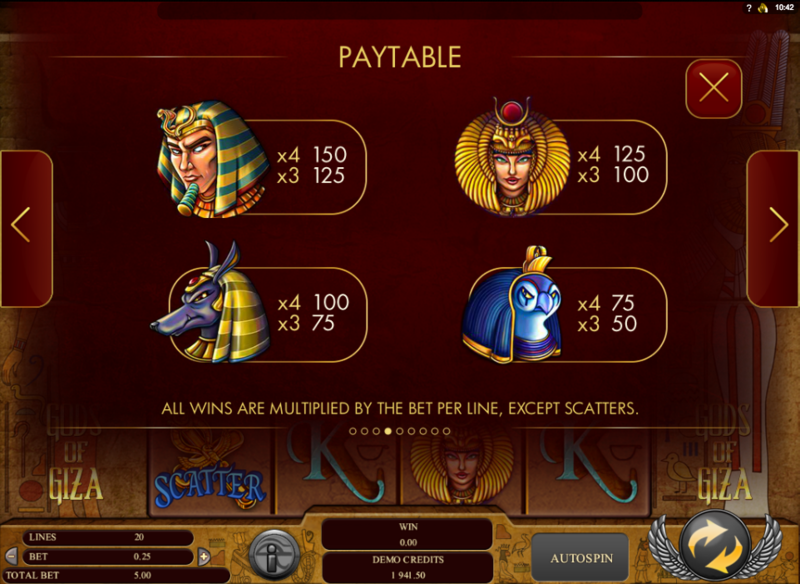 Gods Of Giza is a four reel slot with four rows and twenty paylines; it’s a 4×4 layout as you can see from the screenshot above. The design is hieroglyphic with interesting characters and pictures surrounding the reels. There are four high value symbols – the Pharaoh, the Pharaoh’s wife and two gods – accompanied by the usual J, Q, K and A. Winning combos pay from left to right on adjacent reels starting from the left. The ornate scarab beetle is the wild which substitutes for everything except the scatter; the scatter is the gold Ankh which activates the feature. 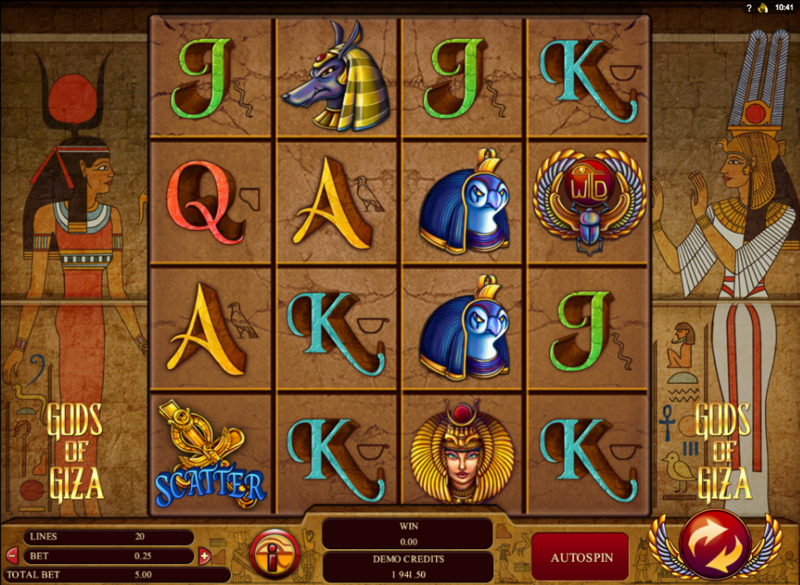 This extra feature is triggered by landing three or more of the Ankh scatter symbols anywhere in view; you will now receive eight free spins but it’s after each spin that the fun starts. After every spin any wins will be evaluated and then the reels will rotate 90 degrees with hopefully more wins formed; there are four rotations in total after each spin so it’s almost like getting thirty two free spins rather than just eight. It’s possible to re-trigger more spins by landing three more scatters but you can only do so on the initial free spin, not the extra rotations. Gods Of Giza certainly looks the business but it does seem to lack the small spark of excitement which differentiates good games from really good games; the bonus feature is interesting though and the RTP is 96.13%.